The treatment of patients with acute asthma requires pharmacologic therapy with bronchodila-tors, corticosteroids, oxygen and other appropriate supportive measures. 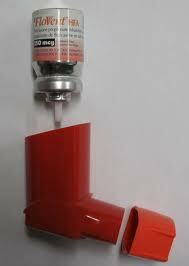 Inhaled betag agonists and intravenous xanthines are the most commonly used bronchodilator medications in acute asthma. Earlier studies in patients with acute asthma have usually compared the bronchodilating effects of inhaled selective betas agonists alone, and combined with intravenous xanthines in patients with acute asthma. Enprofylline (3-propylxanthine) is a new xanthine derivative which is potentially superior to theophylline because it is predominantly cleared by renal excretion and is not affected by alterations in metabolic clearance. Enprofylline also appears to have another advantage in that central nervous system effects such as convulsions have not been observed in animal studies. It has been suggested that the difference in side effect profile is related to the poor adenosine antagonism of enprofylline. Studies comparing intravenous enprofylline and aminophylline have shown that both are bronchodilator drugs capable of achieving similar degrees of bronchodilation, but that enprofylline is more potent on a molar basis. The aim of this study was to compare the bronchodilator and unwanted effects of intravenously administered enprofylline vs inhaled terbutaiine in patients with acute asthma in eight Australian hospitals. One hundred twenty three adult patients presenting to hospital with an acute exacerbation of asthma were entered into this parallel study. The inclusion criteria for patients were: 1) presentation to hospital with an acute exacerbation of asthma; 2) a forced expiratory volume in one second (FEVj) of between 15-50 percent of predicted value; 3) a heart rate of >90 beats per minute; 4) reversibility in the FEVj of >15 percent by a bronchodilator agent (demonstrated at some time within six months prior to, during or up to two months after the study); 5) age between 18-70 years; and 6) an expressed willingness to participate in the study, with written informed consent obtained. As a result of these criteria, all patients fulfilled the ATS criteria for asthma. The exclusion criteria were: 1) severe associated cardiovascular, hepatic or renal disease; 2) patients with arterial Po2 <65 mm Hg on supplemental oxygen, or arterial Pco2 >50 mm Hg (arterial blood gases were measured if the FEVj was <25 percent of predicted at entry); 3) baseline plasma theophylline level of >15 μg/ml; 4) women of childbearing age not practicing effective contraception; 5) pregnancy, diabetes, hyperthyroidism; and 6) known sensitivity to sympathomimetic agents.